Paul Stastny (born December 27, 1985) is a Canadian-born American professional ice hockey center currently playing for the Vegas Golden Knights of the National Hockey League (NHL). Of Slovak lineage, Stastny is the son of Hockey Hall of Famer Peter Šťastný, who played for the Colorado Avalanche's predecessor, the Quebec Nordiques, and finished his career with the St. Louis Blues. His older brother Yan has played for the Boston Bruins, Edmonton Oilers and St. Louis Blues. His uncles Anton and Marian Stastny both played in the NHL during the 1980s, also for the Nordiques. Stastny began his junior hockey career with the River City Lancers of the United States Hockey League before moving to the University of Denver Pioneers in 2004. He won the NCAA Men's Ice Hockey Championship in his first season playing for the Pioneers. He remained at the University of Denver for one more season. He signed a contract with the Avalanche before the 2006–07 NHL season, scored 78 points in 82 games in his rookie season and was nominated for the Calder Memorial Trophy. In 2007–08 he was named to his first NHL All-Star Game, but didn't play because of an appendectomy. As a dual citizen, Stastny has chosen to play for the U.S. in international hockey competitions, which have included the 2004 Viking Cup, the 2007 IIHF World Championship, and the 2010 and 2014 Winter Olympics. Stastny was born in Quebec City, Quebec, to Peter Šťastný (anglicised to Stastny) and his wife Darina, while Peter was playing for the Nordiques. Paul spent his early years in Quebec and New Jersey, following his father's career. Peter joined the St. Louis Blues in 1993 and settled there after finishing his player career, working as a scout for the team. Paul has numerous family relatives who have played in the NHL. He is the son of Czechoslovak defector and Hockey Hall of Fame inductee Peter Šťastný (surname later anglicised), the first European-trained player to reach 1,000 points in the NHL, and the nephew of retired NHL players Anton and Marian. Peter and Anton were the first two out of the three brothers to come to North America, in 1980; they were smuggled, along with Peter's pregnant wife with the help of the Quebec Nordiques' owner Marcel Aubut and chief scout Gilles Léger out of Czechoslovakia to Austria. Marián arrived a year later, after Peter and Anton raised the $30,000 needed to bribe officials of the Czechoslovak government. All 3 played for Quebec from 1981–1985, which was only the third time that 3 brothers played for the same team in the NHL at the same time. The first three brothers who had played for the same team were Reg, Doug and Max Bentley, followed by the three Plager brothers, Bill, Barclay and Bob who played with the St. Louis Blues from 1968–72. Paul's older brother Yan has played for the Boston Bruins, Edmonton Oilers, and St. Louis Blues. He currently plays for CSKA Moscow in the KHL. Peter and Paul Stastny currently rank fourth all-time in total scoring by a father-son combination in the NHL. As a youth, Stastny played in the 1999 Quebec International Pee-Wee Hockey Tournament with the St. Louis Blues minor ice hockey team. Paul played high school hockey for Chaminade College Preparatory School in St. Louis, Missouri during his freshman and sophomore years in high school, but he left the high school team to play for the Tier III Junior B St. Louis Jr. Blues. He then moved to Omaha, Nebraska to play Tier I junior hockey for the River City Lancers of the United States Hockey League during this last two years of high school, graduating from Millard North High School in Omaha. Born in Canada to a mother with American citizenship, Stastny and his brother Yan have dual Canadian/U.S. citizenship. He also has two sisters, Katarina and Kristina (married to Mike Nash). He has mentioned "religion, education and the importance of family" as important values in his upbringing, and has spoken about his father's help in making him a better player. Paul Stastny began his junior ice hockey career in 2002 with the River City Lancers of the United States Hockey League, playing with the team for two seasons, scoring 107 points in 113 games. In 2002–03, the Lancers finished the regular season fourth in the West Division and progressed to the playoffs. After advancing two rounds, the Lancers lost in the Clark Cup final against the Lincoln Stars. In 2003–04, the Lancers finished third in the West Division and lost in the first round of the playoffs against the Sioux City Musketeers. Stastny's 77 points in 56 games ranked him second in the league behind teammate Mike Howe. Stastny entered the University of Denver to play for the Pioneers in the Western Collegiate Hockey Association of the National Collegiate Athletic Association in 2004. Despite entering college hockey younger than the usual USHL player, he scored 45 points in 42 games in his first season in Denver to help the Pioneers win the MacNaughton Cup and Broadmoor Trophy. He then helped the team win its second NCAA Men's Ice Hockey Championship in a row by scoring two power-play goals in the final game at the 2005 Frozen Four tournament against North Dakota. Stastny won the award for WCHA Rookie of the Year and was part of the WCHA All-Rookie Team and the NCAA Championship All-Tournament Team. In 2005–06, Stastny scored 53 points in 39 games and finished 7th overall in the NCAA scoring list, tied with Matt Carle for the Pioneers' scoring lead. He scored 44 points in 28 conference games to win the WCHA scoring title. He was part of the WCHA First All-Star Team and the NCAA West Second All-American Team, as the Pioneers finished the WCHA regular season in second place and lost in the first round of the playoffs against the Minnesota-Duluth Bulldogs. At the end of the season, Stastny left the University of Denver as a business major. Stastny was draft-eligible in the 2004 NHL Entry Draft, but opted out of the draft. Prior to the draft, the NHL Central Scouting Bureau ranked him as the 49th best North-American skater available. Ranked by CSB as the 74th best in the 2005 NHL Entry Draft, he was drafted by the Colorado Avalanche in the second round, 44th overall. Before moving to Denver in 1996, the Avalanche were the Quebec Nordiques, the team for which his father played from 1980–1990 and had his jersey number retired. 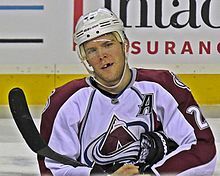 Stastny signed a multi-year contract with the Avalanche on July 24, 2006, and began his professional career in the 2006–07 NHL season. Stastny being mentored by Joe Sakic, who was mentored by Stastny's father, Peter, when Sakic started his career with the Nordiques. Before training camp, it was not expected he would start the season with the Avalanche, but rather for an affiliate team of the Avalanche. However, Steve Konowalchuk's career-ending heart problem opened a roster spot and Stastny's play impressed Avalanche coach Joel Quenneville. Stastny started the season with the jersey number 62 until his teammate John-Michael Liles (switching to #4) changed his to let Stastny use #26, the same his father wore when he played for the franchise while it was in Quebec. Stastny had his first NHL assist on a goal by Wojtek Wolski in his third NHL game, on October 8 against the Vancouver Canucks. On October 21, in his eighth NHL game and first wearing number 26, Stastny scored his first NHL goal in Montreal against David Aebischer of the Montreal Canadiens. On February 21, 2007, Stastny scored two goals and passed Alex Tanguay's total of 51 points to set a new Avalanche record for points by a rookie. His father holds the franchise record with 109. Between February 3 and March 17, he had a 20-game scoring streak, breaking not only his father's franchise rookie record of 16 games, but also the NHL rookie record of 17 games that belonged to Teemu Selänne. He scored 11 goals and had 18 assists during that period and became the third-youngest player in NHL history to record a 20-game scoring streak, following Mario Lemieux and Wayne Gretzky. At the start of the season, Wojtek Wolski was the Avalanche player seen as favorite to contend for the Calder Memorial Trophy; however, the scoring streak put Stastny into contention as well. Stastny's play was one of the reasons the Avalanche experienced their best run of the season towards the end, winning 15 of their last 19 games but missing the playoffs by one point. Stastny ended his rookie season with 78 points, finished second to Pittsburgh Penguins' Evgeni Malkin in the voting for the Calder Memorial Trophy and was named to the 2006–07 NHL All-Rookie Team. Stastny takes a shot during warm-ups prior to a game in the 2007–08 season. Coming into his sophomore season, Stastny admitted the pressure would increase during the year. He continued the strong finish of his rookie year, by scoring his first career hat-trick against Marty Turco of the Dallas Stars in the season's first game and scoring five points for the first time four days later, against the San Jose Sharks. He scored 15 goals and had 28 assists in his first 34 games of the season, and had his 100th NHL point in his 99th NHL game. At the same time, Stastny hit a slump, during which he had one point in eight games. With the Avalanche having lost top players Joe Sakic and Ryan Smyth to injuries, Ryan Kennedy of The Hockey News pointed to Stastny's inconsistency and wrote it was time for Stastny to step up and be a leader in all aspects. Despite being on the longest scoreless streak of his career, which lasted 10 games, on January 11, 2008, the NHL announced Stastny would play at the 56th National Hockey League All-Star Game. He scored two goals and three assists in three games before the Colorado Avalanche announced six days later that Stastny would miss approximately 2–3 weeks, including his first All-Star Game to have his appendix removed. After recovering from the surgery and returning to skating, he suffered a groin injury during a practice, delaying his return. Stastny ended up missing 15 games, but he scored a goal on his comeback against the Phoenix Coyotes on February 22. He scored seven goals and had 15 assists until the end of the regular season, missing a game due to flu on March 20. With 71 points scored, he finished the regular season as the team's scoring leader and the Avalanche finished 6th in the West, progressing to the playoffs to play against the Minnesota Wild. Stastny failed to score a point until the fifth game, when his game-winning goal gave the Avalanche the lead in the series. Colorado ended the series by winning the sixth game and progressed to meet the Detroit Red Wings in the Western Conference Semifinals. Stastny scored a goal and an assist in the first game of the series, but a depleted Avalanche team was swept in four games. Stastny missed the last game of the series after he injured his knee during the first period of the third game. On November 17, 2008, Stastny signed a US$33-million, five-year contract extension with the Avalanche. The contract began in the 2009–10 season and runs through 2013–14; he was paid an average of $6.6 million a year. Stastny earned $710,000 during the 2008–09 season. Stastny with the Avalanche in the 2013–14 season. In a December 23, 2008 game against the Phoenix Coyotes, Paul suffered a fractured forearm after being struck by a shot from Phoenix's Olli Jokinen in the last regulation minute of the game. He successfully underwent surgery on his arm and missed 24 games, but also his chance to play in the 2009 All-Star Game in Montreal. This was the second consecutive season that he missed such an opportunity. He was injured again later in the season when he broke his foot while blocking a shot during a March 17, 2009 game against the Minnesota Wild, putting him out of play for the rest of the season. He scored 36 points in just 45 games that year. The 2009–10 season proved successful for Stastny and the Avalanche. He stayed uninjured the entire season, and only missed one game as a healthy scratch after the Avalanche clinched a playoff spot the previous evening. His 79 points (20 goals, 59 assists) was a career best, and he led the team in points and assists. Tied with Alexander Ovechkin, only five players in the league ended up with more assists. Stastny's second career appearance in the post season ended after the San Jose Sharks eliminated the Avs in the first round. On January 26, 2011, Stastny was named to his second NHL All-Star Game. He and his father became the 8th father-son duo in NHL history to both play in an All-Star Game. With the delay of the 2012–13 season due to the lockout, Stastny followed his brother's footsteps to Germany and signed his first European contract with EHC München of the Deutsche Eishockey Liga on November 15, 2012. Stastny appeared in 13 games for Red Bull climbing to third among the team with 18 points before returning to the Avalanche upon the tentative lockout resolution on January 6, 2013. Stastny signed a four-year deal with the St. Louis Blues in July 2014. At the trade deadline of the 2013–14 season, the Avalanche and their GM, Joe Sakic were looking to trade Stastny to ensure a return for the soon-to-be Free Agent. Stastny promised them a "Hometown Discount" if they held onto him through the Avalanche playoff run. At the conclusion of the season, Stastny had a change of heart about the discount. Unable to agree to a new contract with the Avalanche as a free agent, Stastny signed a four-year $28 million contract with hometown club and Avalanche rivals, the St. Louis Blues, on July 1, 2014. Skating in 74 games in his first season with the Blues, Stastny scored 16 goals to go with 30 assists. On February 26, 2018, in the final year of his contract, Stastny was traded to the Winnipeg Jets in exchange for Erik Foley, a conditional first-round pick in 2018 and a conditional fourth-round pick in 2020. In his Jets debut, Stastny scored a goal and an assist in a 6–5 loss to the Nashville Predators. On July 1, 2018, Stastny as a free agent signed a three-year, $19.5 million deal with the Vegas Golden Knights. It has an annual value of $6.5 million. Although born in Canada, Stastny is a dual citizen of Canada and the United States. Both he and his brother Yan have chosen to play internationally for the United States. Among the reasons that led him to choose to play for the United States was the possibility to play in an international competition with his brother, who had chosen to play for the United States before Paul. Paul represented the U.S. for the first time in the 2004 Viking Cup, where he won a silver medal playing for the junior team. According to Hockey's Future, he was one of the most important American talents in the tournament. Stastny played internationally for the United States national ice hockey team for the first time in the 2007 IIHF World Championship. He played seven games, scored four goals and four assists, had two penalty minutes and finished even in plus/minus. The United States lost in the quarterfinals against Finland. Stastny was named the best American player in the 3–0 win against Germany, when he scored two goals and had one assist. He was chosen as one of the three best United States players at the tournament, together with Lee Stempniak and Toby Petersen. Stastny was selected to play for the U.S. men's ice hockey team in the 2010 Winter Olympics in Vancouver where he won a silver medal. He scored a goal and two assists over six games. Upon completion of a disappointing 2012–13 season with the Avalanche, Stastny accepted an invite to the 2013 World Championship event in Finland/Sweden and was selected as Team U.S. Captain. He led the largely unheralded U.S. team, in claiming their country's first medal at the Championships since 2004, with shootout victory over Finland for Bronze on May 19, 2013. Stastny finished the tournament in second place in individual scoring with 15 points in 10 games, resulting in selection to the World Championship All-Star Team. Stastny is a left-handed center and was one of the few NHL players known to use a wood stick since 2005, preferring it through his first four seasons in the NHL. However, he made the switch to a graphite stick to begin his 2010–11 NHL season. He considers himself a playmaker, a characteristic he says he inherited from his father. Paul reminds me a lot of his dad. ... His play-making ability, his vision on the ice, the ability to come up with loose pucks – the puck just seems to follow him around. But his play without the puck is the part that we enjoy. For a young kid, to have that hockey sense, is unusual. Joel Quenneville, The Globe and Mail, "The Stastny bloodline is clear to see"
Former Avalanche captain Joe Sakic, who played with Paul and Peter Stastny, sees similarities between the two, namely their strong skating and ability to see the game. Former Avalanche coach Joel Quenneville, who faced Peter during his playing career, has said Paul plays in a similar way and complimented his hockey sense. George Gwozdecky, Stastny's coach at the University of Denver, has complimented his intelligence, ability to pass and see the ice. Although it has been said that Stastny is a slow skater, Gwozdecky too feels he is a strong skater. Terry Frei of ESPN has said that "... his game isn't flashy and eye-popping as much as it is heady, intuitive and efficient". ^ a b c d Frei, Terry (2007-03-13). "Paul Stastny showing skills only genes can provide". ESPN. Retrieved 2008-01-04. ^ Podnieks, Andrew. "Spotlight – Peter Stastny". Legends of Hockey. Archived from the original on 2008-04-14. Retrieved 2007-01-04. ^ a b Pincus, Arthur (2006). The Official Illustrated NHL History. Calton Books. pp. 147–148. ^ "USHL Standings 2002/03". Pointstreak.com. Retrieved 2007-01-05. ^ Profile, uscho.com, February 25, 2007. ^ Profile Archived 2014-03-23 at the Wayback Machine Archived 2014-03-23 at the Wayback Machine, chaminade-stl.org; accessed May 1, 2014. ^ Profile Archived 2014-03-23 at the Wayback Machine, duclarion.com; accessed April 30, 2014. ^ Profile, omaha.com; accessed April 30, 2014. ^ Profile Archived 2014-03-23 at the Wayback Machine "Archived copy". Archived from the original on 2014-03-23. Retrieved 2017-05-09. CS1 maint: Archived copy as title (link), sportsnetwork.com; accessed April 30, 2014. ^ a b Buccigross, John (2007-12-27). "Richards' hefty deal can actually bring the people together". ESPN. Retrieved 2008-01-28. ^ a b c d Mindenhall, Chuck (2007-04-10). "Six pedigrees of separation". The Hockey News. Archived from the original on 2007-12-10. Retrieved 2008-01-04. ^ Allen, Kevin (2006-11-30). "Rookie pair fitting in with Avs". USA Today. Retrieved 2009-01-28. ^ "USHL 2003 Playoff bracket". Pointstreak.com. Retrieved 2007-01-05. ^ "USHL Standings 2003/04". Pointstreak.com. Retrieved 2007-01-05. ^ "USHL 2004 Playoff bracket". Pointstreak.com. Retrieved 2007-01-05. ^ "USHL 2003/04 Scoring leaders". Pointstreak.com. Retrieved 2007-01-05. ^ a b c d e f Frei, Terry (2007-10-11). "Stastny following father's footsteps in more ways than one". ESPN. Retrieved 2007-01-04. ^ "Denver Pioneers Men's Hockey: Year-By-Year". United States College Hockey Online. Archived from the original on 2007-12-01. Retrieved 2007-01-05. ^ Lapointe, Joe (2005-04-10). "Denver Wins Title Again, With Stastny Scoring 2 Goals". New York Times. Retrieved 2007-01-05. ^ "Paul Stastny bio". Colorado Avalanche. Retrieved 2013-08-27. ^ "Men's Division I Hockey Overall Statistics: 2005–2006". United States College Hockey Online. Retrieved 2013-08-30. ^ "WCHA Men's Conference Statistics: 2005–2006". United States College Hockey Online. Retrieved 2013-09-11. ^ "Paul Stastny profile". United States College Hockey Online. Archived from the original on 2007-06-10. Retrieved 2007-01-05. ^ "Denver Men's Hockey 2005–2006 Schedule and Results". United States College Hockey Online. Retrieved 2013-09-19. ^ a b c Sadowski, Rick (2006-09-12). "Stastny's genes are advantage to rookie". Rocky Mountain News. Archived from the original on March 25, 2007. Retrieved 2007-01-05. ^ Powers, DJ (2004-06-14). "NCAA 2004 draft preview". Hockey's Future. Retrieved 2008-01-25. ^ "2004 Final Ranking – North American Skaters" (PDF). Central Scouting Service. Archived from the original (PDF) on 2009-03-04. Retrieved 2007-01-04. ^ "2005 Final Ranking – North American Skaters" (PDF). Central Scouting Service. Archived from the original (PDF) on 2009-03-04. Retrieved 2007-01-04. ^ "Avalanche Signs Paul Stastny". Colorado Avalanche. 2006-07-24. Retrieved 2013-09-10. ^ Sadowski, Rick (2006-09-29). "Stastny has a leg up". Rocky Mountain News. Archived from the original on March 25, 2007. Retrieved 2007-01-05. ^ The Canadian Press (2006-10-21). "Avs defenceman Liles gives up No. 26 so Stastny can wear father's number". The Hockey News. Archived from the original on 2011-05-22. Retrieved 2008-01-04. ^ Associated Press (2006-10-08). "Svatos scores twice to help put Avs in win column". ESPN. Retrieved 2013-08-28. ^ "Paul Stastny: Game Log – 2006–2007 – Regular Season". Colorado Avalanche. Retrieved 2013-08-29. ^ Associated Press (2006-10-21). "Canadiens 8, Avalanche 5". Colorado Avalanche. Archived from the original on 2013-07-01. Retrieved 2013-09-01. ^ a b "Stastny scorches Flames for two goals". TSN. 2007. Archived from the original on September 29, 2007. Retrieved 2007-03-26. ^ a b c d "Stastny Named To NHL All-Rookie Team". Colorado Avalanche. 2007-06-14. Retrieved 2013-09-03. ^ Associated Press (2007-03-11). "Streak longest in NHL since Heatley's 22 in '05". ESPN. Retrieved 2007-01-05. ^ a b Kelly, Michael (2007-06-25). "After Banner Rookie Season, Stastny Looking For More In Year 2". Colorado Avalanche. Retrieved 2013-09-16. ^ Sadowski, Rick (2006-09-11). "For Avs' Wolski, at least more of a role is a given". Rocky Mountain News. Archived from the original on 2016-09-10. Retrieved 2008-01-29. ^ Klein, Jeff Z. & Reif, Karl-Eric (2007-03-18). "Colorado Rookie Has Ice in Bloodlines". New York Times. Retrieved 2008-01-29. ^ "Colorado 2, Minnesota 3". ESPN. 2007-03-11. Retrieved 2008-01-29. ^ Dater, Adrian (2007-06-14). "Calder just eludes Stastny". Denver Post. Archived from the original on 2011-05-24. Retrieved 2008-01-29. ^ Allen, Kevin (2007-10-11). "Stastny carries strong finish into second season". USA Today. Retrieved 2008-01-29. ^ Matuszak, Bob (2007-10-03). "Avalanche 4, Stars 3". Dallas Stars. Archived from the original on 2013-09-05. Retrieved 2013-09-05. ^ Associated Press (2007-10-07). "Avalanche 6, Sharks 2". NHL. Retrieved 2013-09-06. ^ a b c d "Paul Stastny Game Log: 2007–2008". Colorado Avalanche. Retrieved 2013-09-18. ^ Associated Press (2007-11-11). "Avalanche 4, Wild 2". Minnesota Wild. Retrieved 2013-09-20. ^ Kennedy, Ryan (2008-01-04). "Time for Wolski and Stastny to man up". The Hockey News. Archived from the original on 2008-02-07. Retrieved 2008-01-29. ^ Associated Press (2008-01-10). "Avalanche center Paul Stastny makes first All-Star team". ESPN. Retrieved 2013-09-24. ^ "Stastny Out Two to Three Weeks". Colorado Avalanche. 2008-01-17. Retrieved 2013-09-25. ^ Dater, Adrian (2008-02-14). "Revolving door for Avs ... again". Denver Post. Archived from the original on 2011-05-24. Retrieved 2008-02-15. ^ Associated Press (2008-03-20). "Flames 2, Avalanche 1". NHL. Retrieved 2013-09-27. ^ "2007–08 Colorado Avalanche Roster and Statistics". Hockey-Reference. Retrieved 2013-09-29. ^ "2007–08 NHL Season Summary". Hockey-Reference. Retrieved 2013-09-29. ^ Dater, Adrian (2008-04-17). "Avs defeat Wild 3–2 in Game 5". The Denver Post. Retrieved 2013-10-14. ^ Ungar, Lindsey. "Red Wings 4, Avalanche 3". Detroit Red Wings. Retrieved 2013-10-27. ^ a b "Red Wings 8, Avalanche 2". Detroit Red Wings. Retrieved 2013-11-15. ^ "Red Wings 4, Avalanche 3". Colorado Avalanche. Retrieved 2013-11-17. ^ Dater, Adrian (2008-12-25). "Stastny injured, out indefinitely: Wolski could move to center". The Denver Post. Retrieved 2008-12-25. ^ "Stastny to play in first All-Star Game". Denver Pioneers. January 26, 2011. ^ "EHC Red Bull Munich commit to another NHL star" (in German). EHC München. 2012-11-15. Archived from the original on 2012-11-19. Retrieved 2012-11-16. ^ "Wheeler and Stastny travel back to their NHL clubs" (in German). EHC München. 2013-01-06. Archived from the original on 2013-01-08. Retrieved 2013-01-06. ^ "Paul Stastny signs with Blues". ESPN. 2014-07-01. Retrieved 2014-07-01. ^ "Jets acquire Paul Stastny from St. Louis". NHL.com. February 26, 2018. Retrieved February 26, 2018. ^ "Jets' Paul Stastny: Two points in Jets debut". CBS. February 28, 2018. ^ Sadler, Emily (July 1, 2018). "Golden Knights sign forward Paul Stastny to 3-year deal". sportsnet.ca. Retrieved July 1, 2018. ^ "Paul Stastny's Conference Call with NHL Media Members". Colorado Avalanche. 2007-10-09. Retrieved 2013-12-01. ^ a b Sadowski, Rick (2007-04-17). "Stastny, Arnason on U.S. team: Avalanche players will participate in the world championships". Rocky Mountain News. Archived from the original (fee required) on 2014-06-10. Retrieved 2013-12-11. ^ Shaner, Jason (2004-01-18). "USA represented well by Waterloo at Viking Cup". Hockey's Future. Retrieved 2008-01-28. ^ "USA Roster at IIHF World Championship 2007" (PDF). IIHF. Retrieved 2008-01-28. ^ "IIHF World Championship 2007 Scoring Leaders" (PDF). IIHF. Retrieved 2008-01-28. ^ "IIHF World Championship 2007 – USA – GER – Game Summary" (PDF). IIHF. Retrieved 2008-01-28. ^ "IIHF World Championship 2007 – Best players per game" (PDF). IIHF. Retrieved 2008-01-28. ^ "IIHF World Championship 2007 – Three best players of each team selected by coaches" (PDF). IIHF. Retrieved 2008-01-28. ^ "Stastny named captain for U.S. team at Worlds". National Hockey League. 2013-05-03. Retrieved 2013-05-03. ^ "Shoot-out win earns USA bronze". International Ice Hockey Federation. 2013-05-19. Archived from the original on 2013-06-10. Retrieved 2013-05-19. ^ "Josi named MVP". International Ice Hockey Federation. 2013-05-19. Archived from the original on 2013-08-14. Retrieved 2013-05-19. ^ Perez, A.J. (2008-01-15). "Q&A: Colorado Avalanche center Paul Stastny". USA Today. Retrieved 2008-01-29. ^ a b Duhatschek, Eric (2006-11-28). "The Stastny bloodline is clear to see". The Globe and Mail. Archived from the original on 2008-02-12. Retrieved 2008-01-29. Wikimedia Commons has media related to Paul Stastny.